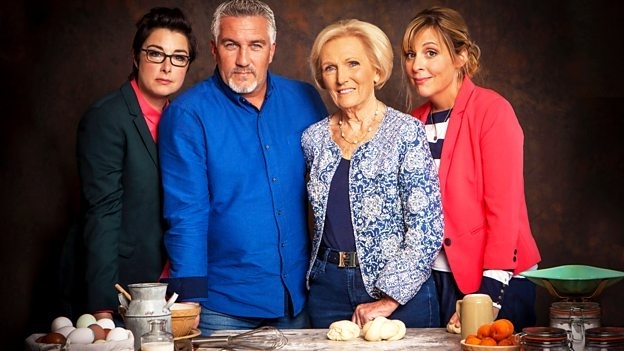 I know I am really late to this party, but I just discovered The Great British Bake Off. I have been catching up on each of the seasons available on Netflix. It’s rare for me to actually be able to binge-watch something, but I can watch The Great British Bake Off all day. I find it helps me destress a bit. I love seeing what the contestants come up with. I admit I haven’t watched the American versions. If you have, feel free to chime in here, but my feeling is that it couldn’t quite work the same way with American contestants because one of the best things about The Great British Bake Off is the fact that even though contestants are competing against one another, they support each other, show each other kindness, and even seem happy for others when they are named Star Baker or win the competition and sad to see contestants go. I’m not sure Americans are like that in a competition. I don’t have this idea fully formed in my head yet, but for the past couple of weeks, I have been wondering what educators can take away from this show. I don’t mean the competition aspect, necessarily, but the structure of the show intrigues me as a learning model. If you haven’t seen it, each week has a different focus: Bread Week, Pastry Week, French Week, etc. Some of these themes repeat each season, while others don’t necessarily. For example, the most recent season available on Netflix included a Vegan Week. Bakers have to display a wide variety of skills and apply what they know about baking to several challenges. The first challenge in each episode (or week) is the Showcase Challenge. This challenge sets a goal, such as making 24 identical buns, that allows contestants to demonstrate their skills. They know the Showcase Challenge in advance and are allowed to practice recipes at home. The second challenge is the Technical Challenge. For this challenge, contestants do not know the recipe, and often, the judges set really difficult baking tasks for the contestants. They must apply what they know about baking to the challenge because in some cases, they are not given full, precise directions. It’s not uncommon, for example, for the baking directions to just say “bake” without offering baking time or temperature. The final challenge each week is the Showstopper Challenge. For this challenge, contestants must impress by going all out to create something truly amazing that fits the theme. For example, if it’s Cake Week, the judges might ask for a landscape cake with a whole scene in edibles. I am a bread baker, somewhat new to baking bread as I had always thought it too intimidating. I’ve been baking bread about a year and a half or so. Not too long. I love baking bread. It tastes good, and it provides just the right amount of challenge coupled with simplicity—after all, it’s mostly just flour, water, salt, and yeast. I have had a sourdough starter going for about 15 months. I started watching The Great British Bake Off thinking I would find it entertaining since I like to bake. I didn’t really expect to learn anything from the show, and not because I’m an expert or anything, but mainly because I don’t usually learn much from television or video. I generally have to read books. I actually will read cookbooks cover to cover. However, aside from learning a few things about baking that I didn’t expect to learn, I also noticed the show teaches a few important skills and competencies that it would be good for all students to learn. What can you produce within the confines of certain expectations with time to practice? What can you produce bringing to bear what you know about baking when you are giving a challenging task? What can you make that will really impress? These skills could be applied to other kinds of learning. What if an art class tried these three different challenges? A Showcase with a chance to paint something you know well? A Technical that challenges you to apply a skill, such as stippling, to create a painting? A Technical that challenges you to apply an array of painting skills to create something. What if a writing class gave students a Showcase challenge that allowed them to write in a genre of their choice about a topic? A Technical that gave a topic and challenged students to write in a specified genre? A Showstopper that asked students to write in several different genres on a topic? These ideas are obviously not fully formed, but I must admit when I watch this show, several things impress me. The contestants take feedback really well and learn from it. They demonstrate a great deal of resilience and dedication to learning. They have to display a wide array of baking skills, probably far more than the average home baker usually knows. As I mentioned before, they are really supportive of each other. I have actually seen several contestants help others when they’re struggling. I can’t help but wonder what might happen in a classroom that looked a little bit like The Great British Bake Off.